Bridge Street proudly presents WILD CHILD: A Live Recreation of a Doors Concert featuring DAVE BROCK on Sunday, July 29th at 6 pm! Born and raised in the San Francisco Bay area, Dave Brock left Northern California in the 1980s to attend school at Long Beach State University. While in college, Dave landed the lead role in The Jim Morrison Rock Opera as the poetically tragic lead singer of The Doors. The late singer's sister, Anna Morrison Graham, and her husband Allan produced the production. Before the production's debut, Brock was featured in many major publications including Rolling Stone Magazine, The Los Angeles Times Calendar, and Bam Magazine. There was quite a buzz in the industry about this production and Dave proved to be quite a good vocalist and performer when the production was ready for the public. After the conclusion of Rock Opera, Dave formed his own live musical stage show performing the music of The Doors called "Wild Child." The live concert show landed at the world famous Whisky a-go-go on the sunset strip on July 3rd, 1986. It was a triple sellout on its very first night. Reviews poured in calling this new show a "must see." The LA Times raves, "Wild Child is a winner! What's amazing is that vocalist Dave Brock sings like Morrison, enough to imperil the snowflake analogy about no two sets of vocal chords to be able to produce the exact same vocal tone." The Daily Bulletin says, "Brock, who bears more than a passing resemblance, evokes the Morrison persona without being forced." Jim Ladd, the famous Los Angeles KLOS FM radio DJ and Rock and roll critic described Wild Child to his listeners: "These guys are excellent, not a cartoon version of The Doors but a very loving and respectful, accurate and well done tribute to The Doors." Since Wild Child debuted, the act has been touring and playing at sold out national act venues and festivals around the world. In 1992, Brock was also noticed by film Director and Producer Robert Zemeckis and played the part of Jim Morrison in the comedy film "Death Becomes Her." In 2010 Ray Manzarek and Robby Krieger of The Doors, invited Dave to tour with them as their vocalist on their concert engagements. This was perhaps the best compliment Dave has ever received from anyone for his work. He presently tours with them. 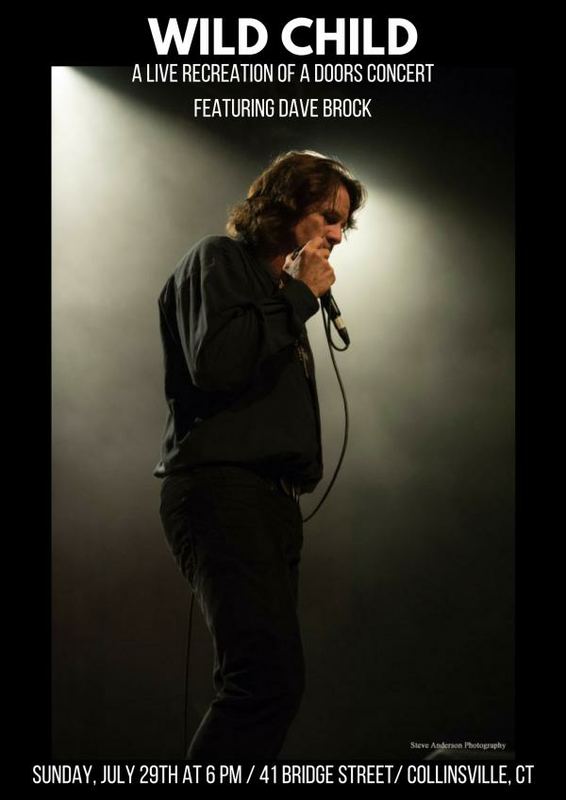 Tickets to see Dave Brock's exemplary tribute to Jim Morrison's Doors are only $25 for General Admission and $35 for VIP Reserved (+ fees).